Mary Chew was born in 1736 at Anne Arundel County, Maryland, into one of Maryland’s most prominent families. She was the daughter of Samuel and Henrietta Lloyd Chew, and a direct descendant of John Chew, who arrived at Jamestown in 1622 on the ship Charitie. William Paca was born on October 31, 1740, at his family’s home near Abingdon, in the British colony of Maryland. He was the second son of John Paca – a wealthy planter of Italian descent. William was a member of the fourth generation of Paca men in Maryland, his great-grandfather Robert having emigrated in the 1640s. William was educated in Philadelphia, graduating from the College of Philadelphia in 1759 with a Bachelor of Arts degree. In the early summer of 1759, Paca returned to Maryland and settled in Annapolis and studied law for two years under Stephen Bordley, one of the colony’s most prominent lawyers. In 1761, Paca traveled to England to complete his studies and spent two years at the Inner Temple in London. Upon his return to Annapolis, Paca was admitted to the Bar, and began his legal career on October 27, 1761, when he was admitted to practice law in Annapolis Mayor’s Court. He eventually qualified to practice in several county courts, as well as the more prestigious provincial courts. Mary Chew married William Paca on May 26, 1763. She was a girl of considerable wealth, and their marriage ensured his position among the Maryland gentry. William was a young lawyer who had just been elected a member of the Maryland Provincial Assembly. Mary gave birth to three children, but only one child survived to adulthood, a son named John born March 17, 1771. During the 1760s, Paca took an active role in Maryland politics. With fellow attorney Samuel Chase, he led local protests in 1765 against the Stamp Act and organized the Anne Arundel County chapter of the Sons of Liberty. An ardent patriot, Paca preferred to work behind the scenes, writing newspaper articles, and leaving the speeches and rabble rousing to others. He and Chase made a terrific team, with Paca writing many of the speeches that Chase would make. At this time, Paca was considered the finest lawyer in Maryland, and was noted for his “incredible insight and logical power.” A distinguished figure in public life, William Paca served as an Annapolis councilman and mayor, a vestryman of St. Anne’s Church, and in 1767, a representative of the town in the Maryland House of Delegates, and remained so through the final Provincial Assembly of 1774. In the early 1770s, Paca joined other Maryland patriots in urging governmental regulation of fees paid to civil officers and in opposing the poll tax, which was used to pay the salaries of Anglican clergy in the American colonies. Elected to the Maryland colonial assembly in 1771, he served for three years, actively opposing British attempts to tax the colonists without their consent. In 1773, Paca became a member of the Maryland Committee of Correspondence. The following year, along with Samuel Chase and Thomas Johnson, Paca acted as counsel for fellow legislator Joseph H. Harrison, who had been jailed for refusing to pay the poll tax. All three men also attended the first provincial convention that same year and received appointments to the First Continental Congress. Mary Chew was described as “an amiable and most agreeable young lady of this City, with a very considerable fortune.” Part of her wealth went toward the building of their five-part Georgian mansion with extensive gardens in Annapolis. Four days after their wedding, the Pacas purchased two lots in Annapolis and soon began building their new home. 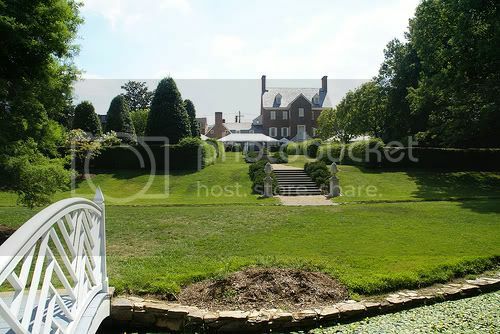 Constructed between 1763 and 1765, the estate is known chiefly for its elegant grounds, including five terraces, a fish-shaped pond, and a wilderness garden. The Paca Garden covers two acres behind the home. Mary Chew Paca did not long survive to enjoy the successes and triumphs that came to her husband during his honored public career. She died on January 15, 1774, at the age of 38. In the interval between Mary Chew Paca’s death in 1774 and his second marriage in 1777, Paca fathered two illegitimate children, by two different women. A daughter named Hester was born August 26, 1775; her mother was a free black woman, creating somewhat of a scandal at the time. Paca raised Hester and sent her to the finest boarding school in Philadelphia. Paca had another child by a woman he did not marry – Henrietta Maria, born in 1776, the daughter of Sarah Joice of Annapolis. In June 1774, the anti-British faction in the Maryland legislature, headed by Paca and Chase, went toe to toe with the proprietary governor. The patriots formed a Provisional Convention that assumed control of the Maryland government. At this convention Paca, Chase, Johnson, and Charles Carroll all received appointments to the Continental Congress, where he served from 1774 until 1779. In the spring and early summer of 1776, the Provisional Convention refused to authorize its Delegates to vote for independence. Paca, Chase, and Carroll worked tirelessly to build alliances and gain the support needed within the Convention. Finally the convention was swayed, and on the floor of the Continental Congress, Maryland voted for independence on July 1 and 2, 1776. On August 2, 1776, Paca, Chase, Carroll, and Thomas Stone signed the Declaration of Independence for Maryland. On February 28, 1777, while a delegate in the Congress, William Paca married Anne Harrison, daughter of Philadelphia merchant and former mayor Henry Harrison. In October 1778, the couple had a son Henry. Paca meant it when he pledged his life, his fortune, and his sacred honor by signing the Declaration. He spent thousands of dollars of his own money outfitting troops and supplying the American Army during the Revolutionary War. In 1777, Paca began a two-year term in the Maryland Senate, served in the militia, and sat on the council of safety. 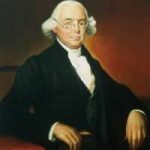 In 1779, Paca resigned his position in the Continental Congress to become Chief Justice of the Maryland Superior Court. Paca distinguished himself in that position, then as Judge of the Admiralty Court, which tried maritime cases. Between the years 1778 and 1782, Paca distinguished himself in those positions. Anne Harrison Paca died on February 18, 1780, at age 23; their son Henry died in 1781. A few months after Anne’s death, Paca sold his home in Annapolis and moved to Wye Island on Maryland’s Eastern Shore, although he continued to own property in and spend time in Annapolis. Mary Chew Paca had inherited half of Wye Island, which passed to William Paca after her death. Paca resigned his judgeship when elected Governor of Maryland in 1782. As Governor, he concerned himself with the welfare of war veterans and other postwar problems; he raised funds for Washington College, the first institution of higher learning in Maryland, and served on its board of visitors. He served three one-year terms (the statutory limit) and was in office when Congress met in Annapolis in 1783-1784, where it ratified the Treaty of Paris on January 15, 1784. In his later life, Paca became one of America’s wealthiest men. Following the expiration of his third term in 1785, Paca moved permanently to his plantation on the Eastern Shore. The Wye Plantation house was extensively renovated in 1790, with Joseph Clark as architect, at a cost of $20,000. In 1786, Paca represented the Eastern Shore district (Queen Anne County) in the House of Delegates. When the US Constitution was written in 1787, the Bill of Rights (the first ten Amendments to the Constitution) was created to ensure personal freedoms and to limit Federal powers. William Paca wrote the provisions for freedom of religion, freedom of the press, and legal protection for citizens accused of crimes. Paca represented Harford County at the Ratification Convention held in Baltimore in April 1788, and urged its adoption. Despite Paca’s opposition to the new government, President George Washington appointed him Federal District Judge for Maryland in December 1789, a position he held for the remainder of his life. 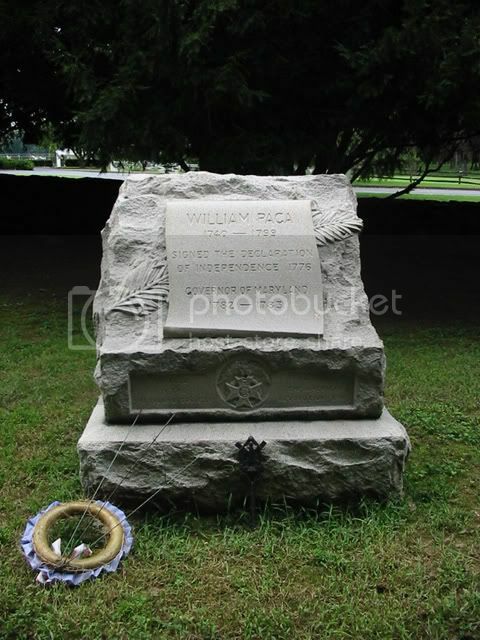 William Paca died on October 13, 1799, at Wye Plantation less than three weeks before his 59th birthday, and is buried at the family cemetery there.